Olentangy Liberty’s Teegan Pifher (30) puts up a shot over Hilliard Bradley’s Jaiden Bryant (14) during the first half of Tuesday’s non-league showdown in Powell. 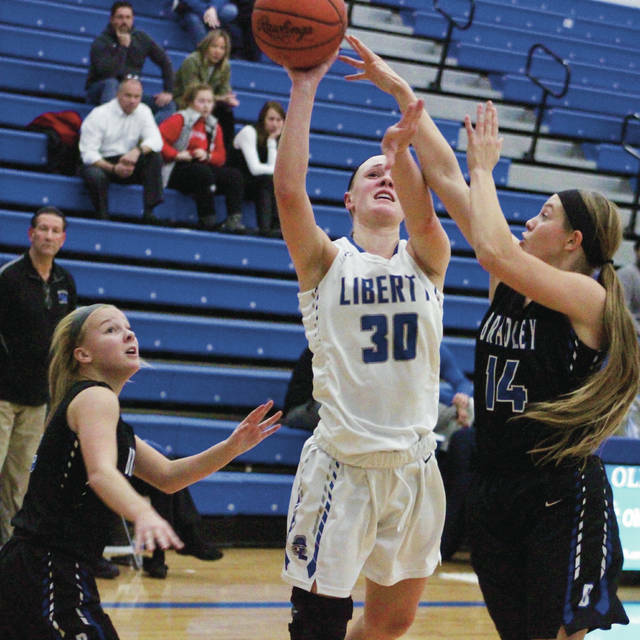 POWELL – There were times that it looked like the Olentangy Liberty girls basketball team was going to run away with Tuesday night’s non-league game against Hilliard Bradley. Then there were times it looked it like it was going to let it slip away. But, Jessie Barna’s layup gave the Patriots the lead for good, Gina Santangelo followed with a pair of three-pointers to create some distance and freshman Trinity Ramos led them with 13 points in a 46-39 win over Bradley. Ramos tied Kelly Levering and Abby Erickson for the team lead with three steals and Levering for the team lead with three assists. Santengelo fed Teegan Pifher for a basket underneath to give the host Patriots (1-1) a 2-0 lead in the opening minute of the game. Ramos turned solid defense into offense on consecutive possessions. She turned a pair of steals into layups to push the lead to six. Barna knocked down a three after a third Bradley turnover to push the lead to 9-0. Bradley held Liberty scoreless for the remainder of the first quarter, closing to within 9-6 before Barna found Levering backside on an out-of-bounds play from the sideline to beat the first-quarter buzzer. Erickson scored all seven of her points down the stretch in the first half to help keep Liberty in front 25-22 at the break. She led the team with eight rebounds and four blocks. Liberty struggled to find offense in the third quarter. Barna hit her second three of the game. But that was the Patriots’ only field goal. Bradley closed within a 30-29 deficit on a Madison Phillis free throw at the end of the third. Phillis and Chloe Callahan scored back-to-back baskets to give the Jaguars their only lead at 34-33 in the fourth. But Barna scored underneath on Liberty’s next possession to give the Patriots the lead right back. Barna finished with nine points and Santangelo added six. Callahan had a game-high 18 points, including a perfect 12-for-12 from the foul line, to lead the Jaguars (0-1). Next up, Liberty opens OCC-Buckeye play at home against rival Olentangy Tuesday at 7:30 p.m. The Barons got their season off to a solid start, limiting the Panthers to a combined five points in the second and fourth quarters on the way to a lopsided non-league win Tuesday in Delaware. BV (1-0) trailed 10-6 after the first quarter, but outscored Linden McKinley 37-15 the rest of the way. Hannah Cowan led the Barons with 12 points while Dani Grether and Chelsea Edington had nine apiece. Alexis Amabile poured in a team-high five three-pointers on the way to a 22-point outburst to lead the Pacers to their second win to start the season Tuesday at Central Crossing. Hayes (2-0) led by a slim 21-20 margin at halftime, but broke things open with a big second half. The Pacers won the third quarter 20-7 and the fourth 17-2 to seal the deal. Alyssa Griner backed Amabile with 10 points, Jordan Lantz added nine and Karli Theis had eight for Hayes.